Over the coming international period, we’re in a unique position as both of our Asian football writers are ready to witness their home nation face arguably their favourite adopted Asian national team. Later in the week Tom Danicek‘s homeland of the Czech Republic host South Korea, but first on Friday Martin Lowe‘s homeland of England host Australia, for the first time in 13 years. Our resident Socceroos observer witnesses the build up and match from the comfort of his own home, from convincing work colleagues of Australia’s quality to the guilt of rooting for the opposition. It’s been 12 years since England have faced Asian opposition; a warm up tie with Japan in a round-robin preparation tournament ahead of Euro 2004, remembered more for the number of substitutes rolled on by Sven Goran Eriksson than the impressive Japanese performance, gaining a 1-1 draw with the English. I remember vaguely the match in question, but I was young, I hadn’t been bitten by the infectious bug which became following Asian football that has engulfed my recent life. Back then, however, I still was hardly brimming with excitement at watching any England match and the tournaments, be it European Championships or World Cups, but the national team and the furore that surrounded it within the media and the general population was probably the first step towards my consideration of other parts of the world to concentrate my footballing watching. My frustration, which by no means is solitary, with the coverage the national team gets has lessened over time. Instead I tend to avoid the matches on TV, saving myself the anguish of yelling at irrational pundits views, and feeble attempts from family members to dig in on my favourite past-time. However for Friday night, I have had to engage with a typical England match build up. From conversations round the water cooler regarding whether Tim Cahill’s still playing or not, to mutterings whilst on holiday with my family last week whether Australia can actually play “our” football, and that it shouldn’t be a challenge as “I haven’t heard of any of them”. I try not to mention my love of Asian football outside the realms of my keyboard, purely for what I assume will be puzzled looks and glazed expressions as I go into finite detail why I think Uzbekistan can qualify for the next World Cup and consider the merits of the foreign player limit on Asian Champions League football. The prospect of England facing an Asian nation feels like that of introducing your mistress to your wife. It’s an encounter I should relish, my home facing my love however I’m not finding it too easy. However this week, people have encouraged my opinions on such matters, asking me which players to watch out for etc., making me question whether in fact I wanted to avoid these questions all along and have actually any hope in these Asian players I watch so regularly after all? The answer is probably not. I have become all too familiar and cosy watching Asian sides play amongst one another I’ve repressed the turmoil of 2014’s World Cup, where victory was a fair distance away for any in the continent. Returning to a supporter state, I’m left crumpled with anxiety, having to watch the same players whom I’m used to seeing succeed on a weekly basis be humbled on the greatest stage warrants me with fear. There are reasons to be optimistic. Ange Postecoglou has revolutionised Australian football within his two year tenure, from an ageing defensive car crash to the competitive multi-faceted continental champions we see today. The prospect of analysing Aaron Mooy taking on elite European midfielders ahead of potentially a summer move in that direction, a rare chance to see Australia counter-attacking and another experiment in search for a Tim Cahill successor was tantalising enough in the build up. The game itself, while being far from a classic had its moments of promise and clumsiness. The neutral skeptic in me pointed to errors in both conceded goals; early nerves stretched the back lines capabilities for Rashford’s opener, while ball chasing defending helped gift the home side’s second. Given the speed in which the build ups had been played at it may have been a tad harsh, but for the rest of the match the fledgling partnership of Mark Milligan and Bailey Wright seemed up to the job. With the ball it was another matter. Mooy kept possession flowing, Robbie Kruse ran the channels and challenged the legs of the English back line, while Tom Rogic had his most impressive game in Socceroos yellow at the tip of the diamond. Yet again the weak spot was within the penalty area, where the lack of a clinical predator (dare I say it) such as Cahill was glaringly missed. Jamie Maclaren, who was well deserving of his debut after a fine season with Brisbane, looked frustrated, nervy but ultimately fed on scraps until his second half withdrawal. The reaction to the 2-1 defeat like the expectation beforehand again differed as an Australian fan abroad. It’s fair to say, quite rightly, the TV commentary I was watching was heavily biased towards the home nation, however the “lack of top quality” stick was used enough for myself to start believing it. I came away rueing what could have been rather than stepping back and assessing the true picture. Australian fans waking up on Saturday morning seemed to be in a much more buoyant mood than I was, some even suggesting the possession they created was deserving of more. It makes me question my expectations going forward, witnessing England players on such regularity doesn’t make them any less a European star, as does the more I watch Australia pummel the likes of Bangladesh it shouldn’t allow me to draw direct parallels when the quality is increased. 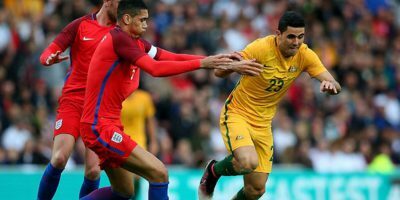 My final thoughts on the matchup; Australia proved demonstrably how far they have come in such a short time, and, while some might not want to admit, eradicating sloppy defensive errors could have seen the Socceroos achieve more this evening. As for my ongoing disregard to the England national team, I’m sure I’ll continue to remain bitter while spinelessly waving my miniature St. George’s flag at the next family BBQ this summer.